In a field just to the E of the picturesque village of Fortingall, on the banks of the River Lyon, stand three groups of standing stones. Closest to the road are a group of four stones (NE) and a group of three stones (SW), while further into the field, closer to the river, is another group of three (S). All are water-worn, smooth, rounded boulders. In 1970, the two settings closest to the road (NE & SW) were excavated by archaeologists from Leicester University including Aubrey Burl. It was found that both had been four-poster variants, each comprising of four large stones at the corners of a rectangle, with four smaller stones mid-way between the larger ones. In both cases, the missing five stones had been pushed over and buried deeply in prepared pits at some point in the nineteenth century. The date is known as one of the stones was found to have a Victorian beer bottle under it. Excavation showed that the SW circle originally had a floor of tiny pebbles within it, and stones of quartz were found by the SSW stone. To the SW of the circle part of an Iron Age jet ring was found. At the centre of the NE circle, a burnt patch containing pieces of charcoal and cremated bone was found. The S setting wasn’t subjected to a full excavation in 1970, but an exploratory excavation at the time revealed a stone hole 4.6m to the NW of the W stone, suggesting a circle of 14.6m in diameter. 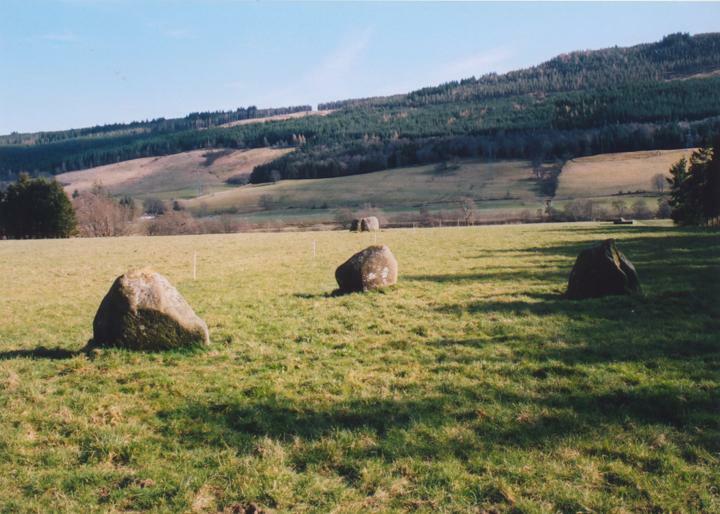 The three remaining stones stand in an almost straight line aligned SE-NW, but taking into account the stone hole, it would appear that this is the remains of an Aberdeenshire-style recumbent stone circle rather than a stone row or four-poster variant like it’s neighbours. Fortingall SW is in the parish of Fortingall and the county of Perthshire. Published on the 14th of May 2010 at 4:20 pm. Updated on the 17th of April 2018 at 5:06 pm.